MOSCOW, January 18. /TASS/. Russia considers it necessary to accelerate the development of digital economy within the Eurasian Economic Union (EAEU), President Vladimir Putin said in his address to heads of EAEU countries released on the Kremlin website on Thursday. "We assume it is necessary to accelerate implementation of the whole ‘digital agenda’ of the Union, and to coordinate efforts on development of ‘Internet economy’, creation of general digital trade rules, equal standards of exchange and protection of information," the statement said. The Russian leader also called for enacting high technologies in public administration, industry, customs regulation systems and other areas, as well as "launching joint competitive, innovative and knowledge-intensive industries." 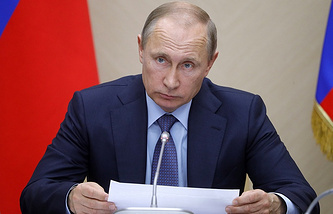 According to Putin, more efforts are required to involve business circles into integration initiatives, including both big, and small and mid-sized enterprises (SMEs), "to use the resources of the Eurasian Development Bank and the Eurasian Fund for Stabilization and Development more efficiently to finance supranational projects with strong integration effect." Such areas as nuclear energy, renewable energy sources, ecology, medicine, space, tourism and sports provide great opportunities for boosting ties between EAEU member-countries, President said, adding that as of now those fields of cooperation within the Eurasian Economic Union "are almost uncovered, though there is a fair amount of interest to them, both from the side of businesses and population." "That is why it seems to be important to dive into those issues in multisided format," Putin noted.